West Bengal Chief Minister and Trinamool Congress (TMC) chief Mamata Banerjee addresses during her party's 25th Martyr's Day rally, in Kolkata on July 21, 2018. Kolkata, July 21 : Raising the pitch for her proposed Federal Front of opposition parties, Trinamool Congress chief Mamata Banerjee on Saturday asked her party workers to launch a fortnight-long campaign from August 1 to defeat the 'communal BJP'. Banerjee predicted that the saffron outfit could end up with less than 100 seats in next year's general election. She also said her party would organise a "huge" rally in the city on January 19 next year, where "leaders from all over the country", including those of the proposed Front would call for defeating the BJP at the centre. 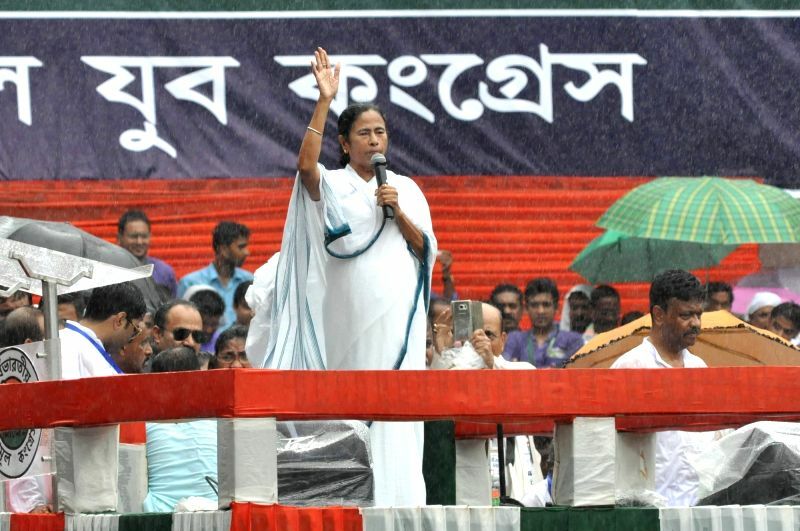 Addressing party workers on the party's Martyrs' Day rally, she said: "Bengal will show the way to India, we will show the way to Parliament in the coming days." Banerjee said the August campaign would have the slogan 'remove communal BJP, save the country'. "On Aaugust 15 (Independence Day), all of you should raise the Tricolour and take a vow to ensure that none from the BJP raises the national flag from the Red Fort from 2019 onwards," she told her party workers. She appealed to Trinamool activists to work for the victory of the party in all 42 Lok Sabha seats in West Bengal in the next year's general elections. Banerjee said the January 19 rally would be held at the sprawling Brigade Parade ground, "from where we will be giving a call to capture power at the Centre." "I will bring leaders from across the country on the stage, including those from the Federal Front," she said. "We will organise the rally in a big way...our workers should ensure a bigger turnout than today's," said. Banerjee The Trinamool supremo, who has in the past made clear her national ambitions, said: "We don't like the chair (top post) that much, we don't care for the chair, but we care for the country, the people, the soil of the land". Referring to the NDA government's victory in the no-confidence motion in the Lok Sabha on Friday, Banerjee said: "They got 325 votes compared to the opposition's 126, but BJP on its own did not get a majority. The AIADMK voted in their favour. Had AIADMK chief Jayalalithaa been alive, they would not have received their votes. They would have lost," she claimed. "I doubt if they would manage to get even 100 seats in 2019," she added. Banerjee said the saffron party would perform poorly in Uttar Pradesh, Madhya Pradesh, Tamil Nadu, Rajasthan and Gujarat, which they had swept in 2014. "They would also not able to do much in West Bengal, Bihar and Odisha,"